This jam, made with Muscat grapes that have a slightly more lively acid profile than most table grapes, is a great foil for well aged goat cheeses. This recipe makes about 12 half pint jars of jam. 1. Remove the zest from the lemons, then juice them. Crush the grapes lightly using a potato masher or a morter to get the juice flowing a little. Stir together the grapes, sugar, zest and juice. Leave at least 8 hours or overnight in the fridge covered with plastic. 2. Put the mixture into a large, non reactive pot and bring to a boil, stirring well. Remove from heat. 3. Puree the mixture finely while still hot. Pass through a medium sieve. Return to a bowl, cover with plastic an chill at least 8 hours or overnight. 4. Put a dinner plate in the freezer. Bring the mixture to a boil in a large non reactive pan. Skim well to remove any foam. Boil about 10 minutes stirring all the time, then check the set by putting a spoonful of the jam on to the cold plate. Continue to boil as necessary, stirring all the time until the desired thickness is reached. 5. Put the jam into sterilized jars and seal according to your favorite method (I like to use inversion...see "Mes Confiture" by Christine Ferber. We lived in Belltown for several years and the food that I miss most was that fabulous quiche at Le Pichet. Any chance you will publish the recipe? I doubled recipe and it didn’t set — maybe because of doubling recipe? I added two pouches of liquid pectin, then whisked in two packages unflavored gelatin. Processing now in boiling water and I am praying! Hi jim- we are set to turn lovely red muscat grapes into jam. Could you tell me why you leave the slurry overnight twice? Is this to let the natural pectin to develop? Today I don’t have the time to leave overnight. Could you suggest the appropriate amount of pectin for 10 pounds of grapes? I base my jam making techniques on the fantastic book by Christine Ferber “Mes Confiture”. In all her jam making, she seeks to maximize the fresh, natural flavor of the fruit by minimizing cooking times. She recommends first macerating with sugar (to get the juice flowing and mixing with the sugar) then boiling and leaving to sit again (letting the sugar, pectin and fruit pulp mix well off the heat). 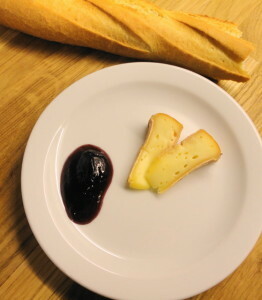 The result is a fresh, lively tasting jam redolent with the flavor of the grapes. Thank you very much. I’ll try it!